* Active PFC design, which can protect the XBOX ONE console and enjoy yourself in games, when the input voltage is not stable. * In view of the big-screen high-definition TV, it has strong anti-interference, no snowflake point images, no moving images. 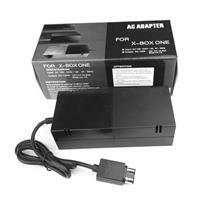 The Product is suitable for the XBOX ONE console. It is with DC stable output and has built-in protection circuit for overcharge, over voltage, short circuit.